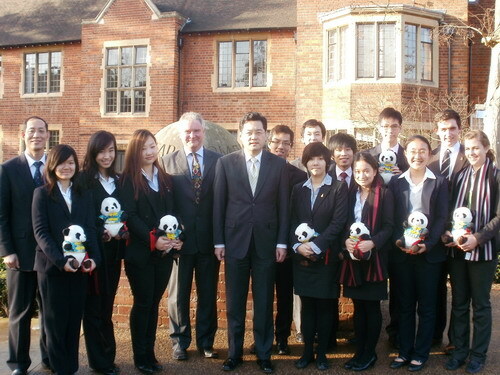 On December 12, at the invitation of Chris Edwards, Headmaster of Bromsgrove School, Chargé d’Affaires Qin Gang of the Chinese Embassy visited the school and had an informal discussion with representatives of Chinese students of the school. Headmaster Edwards warmly welcomed Chargé d’Affaires Qin, made positive remarks on the fast economic and social development in China in recent years and introduced the school and the Chinese students studying there. Chargé d’Affaires Qin thanked the school for the help and support provided to Chinese students, applauded the school’s first-class teaching quality and running conditions and the fostering of students’ interests, potentials and creativities, and highly praised the efforts made by the school to enable students from different countries and ethnic groups to learn from each other and get along with each other harmoniously by respecting cultural diversity and creating necessary conditions. Qin introduced the contents of the “China-UK Education Partnership Action Plan” which has just been signed by the governments of both countries on expanding the basic education cooperation between the two countries, and hoped that Bromsgrove School may continue to strive to introduce the modern China and the Chinese culture, and contribute to promoting the understanding and friendship between the youngsters of the two countries. Accompanied by Headmaster Edwards, Chargé d’Affaires Qin had an informal discussion with some of the students coming from Chinese Mainland, Hong Kong and Taiwan. After learning the students’ studying and living conditions, Chargé d’Affaires Qin encouraged the students to cherish youth, live up to the earnest expectations of their family members and teachers, make full use of the school’s excellent learning environment and conditions, strive to study advanced western culture and knowledge, keep the motherland in mind, take a global view and develop in an all-embracing manner, so as to become versatile talents understanding both Chinese and western cultures and serve as envoys facilitating the communication between China and the West. After that, accompanied by Headmaster Edwards, Chargé d’Affaires Qin looked at the traditional Chinese costumes, handcrafted handbags and paintings designed or made by Chinese students and watched an art performance. Then, he presented to the school books about Chinese history and culture. Established in 1548, Bromsgrove School is one of the oldest schools in the UK history. Currently, more than 300 students from over 40 countries around the world are studying in the school, including over 100 Chinese students.